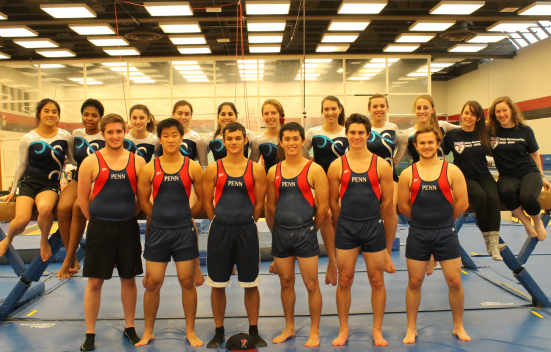 Penn Club Gymnastics is a club team at the University of Pennsylvania managed through PennRec and SCC/SAC. The club is usually composed of 25-30 hardworking men and women, and it aims to provide an opportunity for beginners and experienced gymnasts to develop their skills and pursue their love of the sport. Penn Club Gymnastics is part of the National Association of Intercollegiate Gymnastics Clubs (NAIGC), allowing us to compete in meets throughout the year and compete in the National Championships at the end of the spring semester. The nearly 80 NAIGC clubs across the country form a friendly community in which gymnasts of all levels can compete and progress together. Anyone interested in becoming involved in the club should email pennclubgymnastics@gmail.com.